Ever had the Bug Brothers take your hard earned neopoints? Well now you can get that money back! 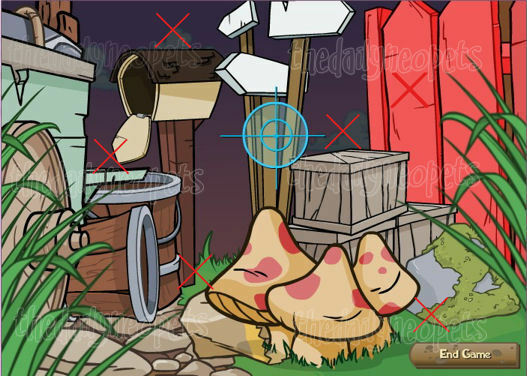 Watch for the Bug Brothers to appear and stop them from stealing anymore neopoints! This is a game of reflexes! First you will choose a weapon. Your choices are bug spray, fly paper, and a net. 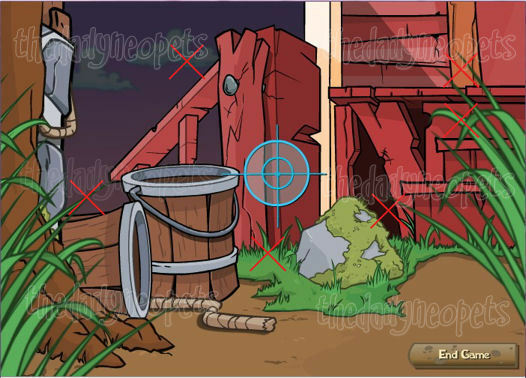 You will use your mouse to aim and click the left mouse button to shoot whatever weapon you chose. Your cursor will turn into a blue target, which you will use to aim at the Bug Brothers. Pretty simple really, you just have to be really fast! There are three levels, as the levels go on you must be faster each time! If you do not shoot the bugs in time you will lose the game. The faster you are the more time bonus points you get for the level. A great method is to use tab to select a bug and enter to "click" it. First bug tab, enter. Hit tab twice quickly to deselect everything. Second bug, tab, enter. You have to wait until the second bug has come ALL the way out. Using keys is MUCH faster than moving your mouse and clicking. This is what level one will look like! The places with the red X's are the places they will pop up. You never know which place, but those are the only places they will show up in the first level. In this level you will receive 50 points per Bug Brother that you shoot! Remember the quicker you are the more neopoints you will get since there is a time bonus for each level. On occasion the second bug will pop up right behind the first bug. When this happens it can be difficult to shoot the second bug since the first one is covering him up. On the first level you have time to try to get him, however on the last two levels it can be difficult and you may just need to restart your game. This doesn't happen very often, but when it does it is rather annoying. This is what level two will look like! 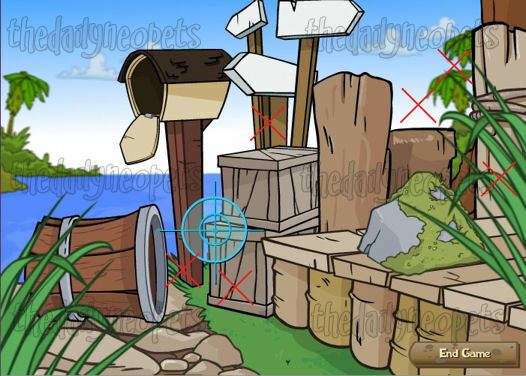 Again the places with the red X's are where the Bug Brothers will show up. In this level you must be quicker than in the last level because you have less time to get them before your game is over. In this level each Bug Brother is worth 75 points, and the time bonus still applies! Just like before, the X's are where they tend to show up. I have yet to see them show up anywhere else, but it may be entirely possible that they do. However, these are the common places I have seen them. The Bug Brothers in the last level are worth 100 points each! And again like the other levels that time bonus still exists! There really isn't a concrete way to beat this game. It really all depends on your reflexes and how fast you can click on those Bug Brothers! After a lot of practice you can get pretty good at the game, and you can almost figure out where they are going to show up once you have played enough. This isn't a game you should expect to get 1K from, but it's a quick game to earn some neopoints from once you get the hang of it.